Me, Beloved, and her blockmates, Hannah and Ivy, ate at H Cuisine some days ago. Now, for otaku, the name might sound funny. The “H” here actually stands for the chef and owner of the place named Hannah. And, no, she isn’t the same Hannah as Beloved’s blockmate, but it is the reason why Beloved wanted to try this place out. Apparently, this place has been featured in many shows and magazines, and is well-praised. Since I don’t watch television, I didn’t even know this place existed. It is found right beside the newly-opened and currently under soft opening Serenitea branch near Tomas Morato, close to the Timog rotonda. We have spent the entire afternoon at the aforementioned place, and since Beloved was hungry, we ate here afterwards. 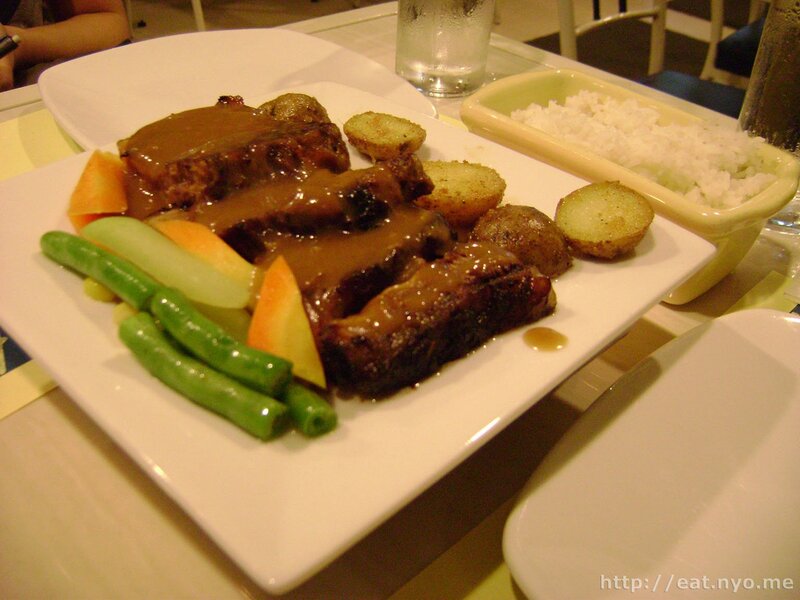 Their specialty is the Most Awesome Angus Beef Belly (288 Php), which I ordered. Beloved had their Lengua Con Cetas (278 Php). 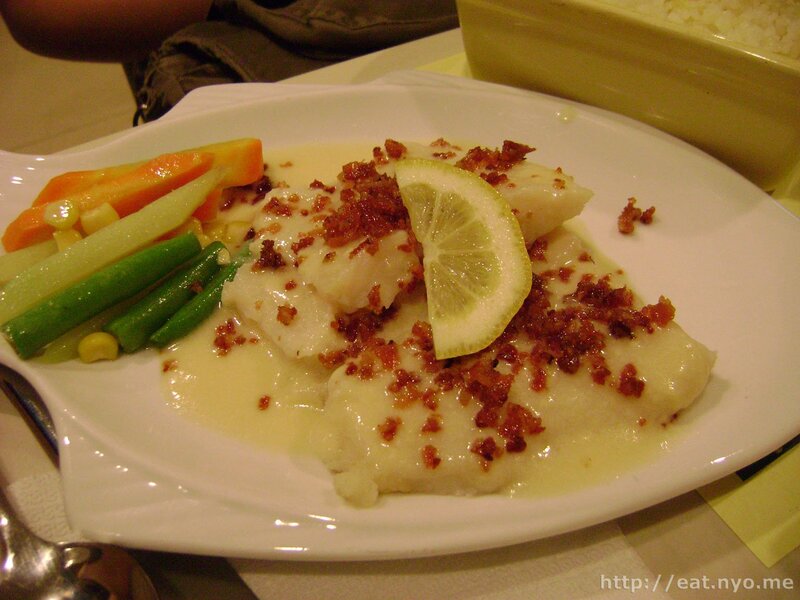 Hannah ordered their Lemon Bacon Cream Sauce on Poached Fish (198 Php). Their specialty, the Most Awesome Angus Beef Belly, which they claimed was good for one, could easily serve three. 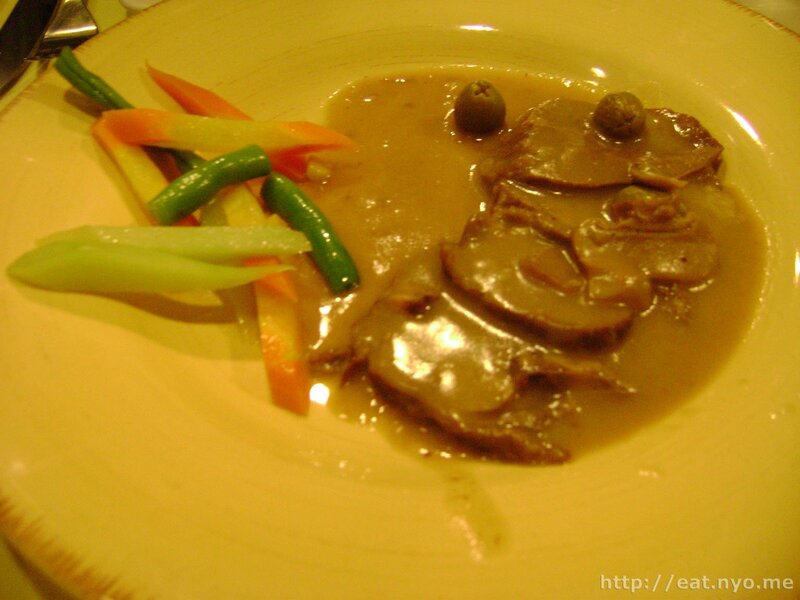 The meat, topped with gravy, was served with veggies and potatoes on a plate over a candlestick to keep it warm. Now, when I forked into the meat, I was very surprised to find out how tender it was. It was literally falling apart by just the fork. And when I bit to it, I confirmed its softness, almost melting texture. I found the gravy to be quite savory, and perhaps essential because the amount of meat was plenty and easily made me fatigued of the taste, especially since it is a bit fatty as expected on the part of meat used. Beloved’s Lengua Con Cetas was similarly soft, as expected from the part of beef it is made of; tongue, for those who don’t know. What surprised me the most is the gravy, which was probably some sort of wine-based sauce, as the alcohol was a prominent taste. Beloved didn’t like the olives it came with, which I indulged myself with. Finally, Hannah’s Lemon Bacon Cream Sauce on Poached Fish was as named. The fish, probably dory, was flaky and also tender, as with all the dishes we ordered. The creamy white sauce was topped with bacon bits. Oh, and it was appropriately served on a plate shaped like a fish. This was a try on the whim, and it was a pleasant try. I understand the high praises this place received from the magazine posters and interviews framed on their walls. The food we tried was ridiculously tender. The servings were quite generous. The price was fair. Overall, H Cuisine was worth the try. Location: Scout Rallos near Tomas Morato. Budget: 200-300 Php per head. Recommended for: Tender food lovers. Not recommended for: Not-so-hungry loners. Smart nomnomnom tip: Their “solo” servings are good for sharing.